Everyone deserves a forever home with someone who loves and cares for them. Some get lucky right from the start, some never find this happiness, and yet many others eventually end up in a good home after a few “bumps in the road.” This is a story with a happy ending about two dogs, on different paths, who eventually found a life together in the same loving home. In the spring of 2017, a sad-looking, full-bred, brindle-colored bull dog wearing a dirty tutu arrived at the Juneau Animal Rescue (JAR). The only info her intake record notes is that her family “moved down south” and for some reason did not take her with them. Blanche was about 5½ years old at the time and she seemed seriously depressed. She was also overweight and had a dirty-feeling coat, probably due to the wrong diet. JAR staff were hoping that someone would see through her less-than-stellar appearance and give her a chance. As luck would have it, Sarah had always wanted a bull dog. She doesn’t know why exactly, except that “bull dogs have a lot of personality and are goofy looking.” She and Kelsey also had another dog at the time -- a pit bull-- that they describe as “the perfect dog”—Zyda. Zyda was getting older, and while they still had her, they wanted to get another dog so Zyda could help teach it to be part of the family. They learned from a friend that a bull dog had been relinquished to the shelter -- not the usual breed that shows up there -- and their interest was piqued. They went to meet Blanche and were hooked right away. 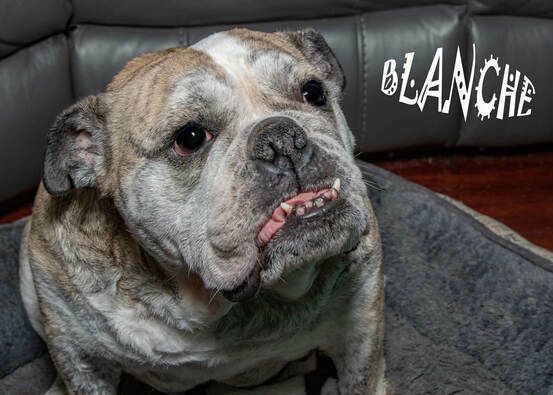 They were moved by her apparent sadness, amused by her goofiness, and loved her name that the shelter had given her, “Blanche White.” They applied to adopt her, and soon were able to take Blanche home. Although they were happy to have Blanche, it took Blanche a while to adjust to her new home. They fed her quality food, gave her lots of attention, and brushed her regularly, yet she still seemed depressed. But after 4-6 months, she started coming out of her shell. They renamed her “Blanche Devereaux”—one of the main characters on ‘The Golden Girls’—to match her more engaged personality. They learned, in a roundabout way, that Blanche is wary of men and that she dislikes Disney songs. They have a male friend who sometimes sings Disney songs when he visits, and Blanche let them know she wasn’t too happy about that circumstance. So life was as good as it gets--- until Zyda died in February 2018. Everyone was sad about her passing and they knew they weren’t ready for another companion. 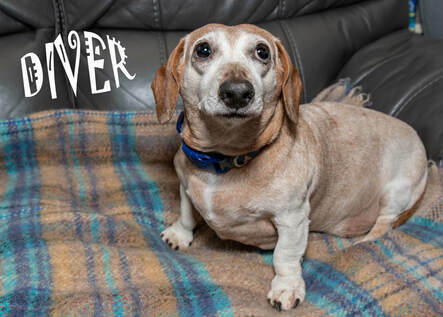 In the meantime, three senior dogs arrived at the shelter, including Diver, a 13-year-old dachshund. Similar to Blanche, his family said they were moving and relinquished him to the shelter. Diver was definitely a senior and had a few health problems, including a heart murmur and a dry eye condition. JAR staff knew it would take a special family to adopt him. Luckily, Diver was a very calm dog that seemed to get along well with people and didn’t mind being in a crowd. In March 2018, the Alaskan Brewing Company was holding a fundraising event at their downtown Depot for JAR, and they encouraged shelter staff to bring some of their animals along for exposure. Diver was an obvious choice! A month had now passed since Zyda’s death, and being active supporters of the shelter, Sarah and Kelsey decided to go to the fundraiser. They also knew that JAR would have some animals there and, the night before the event, they talked and agreed that they were not yet ready to bring a new animal home. So with big arms and eyes wide open, they welcomed Diver into their family. Sarah and Kelsey learned right away that Diver is mostly interested in sleeping and eating. To keep him as active and healthy as possible, they incorporate activities to get him some exercise and movement. Sometimes, they “trick” him into using his brain by hiding food in the grass in the summer so he has to search for it, or putting his food in a maze bowl. Although not “technically” deaf and blind, Diver is definitely impaired, so Kelsey and Sarah also spend a lot of time just being with him and loving him. When asked their favorite things about their dogs, Sarah and Kelsey were quick to answer. Regarding Blanche, Kelsey enjoys that Blanche wants to be near them. Sarah is fond of Blanche’s stubbornness. Regarding Diver, Kelsey loves that he is little enough to snuggle and carry around, and Sarah is happy that Diver has really bonded with their 1-year-old nephew who lives nearby and visits often. They are still surprised by Blanche’s emerging personality. At first she was mostly “one note,” as Sarah described it, but now they are seeing lots more character. And, although Diver is “very chill,” he has a way of getting into mischief by burrowing into things and opening the pantry door. They don’t always know what he is up to. Sarah and Kelsey shared that they have never considered getting an animal from anywhere else but the shelter because they know, from experience, that there are always great animals there that need a home. They said that JAR made the adoption process really easy, which gave them confidence. They also appreciate that when they take their dogs there for regular nail clips, the shelter staff are always interested and genuinely care about how Blanche and Diver are doing. These days, life is pretty normal at their home, and the dogs are truly happy and content. All of them understand and believe that friendship isn’t about whom you have known the longest—rather it’s about those who came and never left your side. As long as we have friendship, today is beautiful!" Story & Photos by Juneau Animal Rescue volunteer Kerry Howard. Sarah and Kelsey Johnston have adopted three dogs from JAR and have loved them all very much.